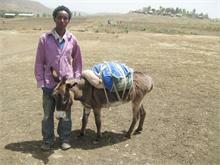 Welcome to Link Ethiopia’s December 2012 News Update! 2012 has been quite a year for us, both in Ethiopia and internationally. Our projects in schools across the north and south of Ethiopia have expanded and we have so many exciting stories to share. To whet your appetite you can read a few highlights of our projects and their achievements in our news update below and do remember that we have more stories on our website blog which you can visit at any time. 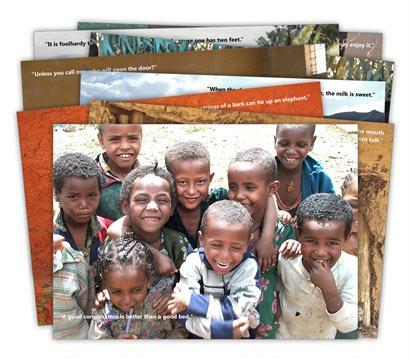 Before we get stuck into our projects roundup, we’d first like to show off our new 2013 Calendar and our Gift Ethiopia website which might help with your Christmas shopping. Our first batch of 2013 calendars sold out fast, BUT, fear not, the second batch has arrived – just in time for Christmas! Each month is illustrated with a beautiful photo, including some of our Link School’s amazing children, the incredible Simien Mountains and the monolithic rock-cut churches in Lalibela. They also carry a thought-provoking Ethiopian proverb on each page which may give you some inspiration. We are really proud of them and at just £8 (or equivalent) they make great gifts. Head over to our calendar page to see more and to get one for yourself or someone you know. Our Gift Ethiopia website is the perfect place to go if you’d like to support our work in schools and give a meaningful present to friends or family at the same time! Christmas is a time for making others happy – and Gift Ethiopia lets you make those you love happy, as well as school children and communities we support across Ethiopia! Donkey libraries, toilets, football teams, school uniforms… Whatever you’d like to support, head over to www.giftethiopia.org to start choosing your gifts! With help from one of our long-term supporters, we have been able to establish a second Donkey Library, in the Dembia Zuria region near Gondar! After the success of our first innovative mobile library we have been keen to widen the benefits to more rural pupils. The new project now supports an extra 4,000 students and we’re really pleased to see it up and running. Water water everywhere, and plenty to drink! Part of our commitment to improving access to quality education is to help make sure children are healthy and well enough to really engage with the available education in their towns & villages. To this end, we have been constructing clean drinking water facilities in a number of our schools across Ethiopia, and one of the latest projects has been at Dukem 2 Elementary School near Bishoftu. We would like to thank our long-term partners World Challenge for assisting with the project. Head over to our projects page to learn more about our Health & Well-being projects. Technology plays such an important role in developing the potential of any country’s future generations that we are delighted to share with you the incredible progress that has been made on some of our technology-focused school projects. At one of our schools, Ambo Tokumma Elementary in western Ethiopia (see picture above), the installation of solar panels has seen many amazing changes to life and work at the school. 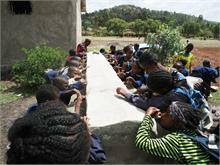 The project has allowed solar energy to be harnessed to power lighting and radios across the school! It also lays the foundations for our ongoing work at the school where we are currently building an IT centre complete with solar powered netbooks and an internet connection – a first for the area! Head over to our technology blog to learn more! We all know how computers are vital to so many aspects of society – work, learning, entertainment, to name just a few. So we are really pleased to see the IT centre at Tana Haik High School in Bahir Dar doing so well! Not only have the computers become an integral part of learning at the school, but the school also took it upon themselves to establish an internet connection, increasing the usefulness of the IT centre even further. (1) The son of which world-famous Portuguese explorer was killed in Ethiopia in the 16th century while fighting against Somali invaders? (2) If someone put an Ethiopian sistrum in your hand, what would you be expected to do with it? (3) The leader of the Communist Derg, overthrown in 1991, was Mengitsu Haile Mariam. In which country does he now reside? Technology charity One Laptop Per Child recently trialled the use of tablet PCs as a means of getting education to young children without access to schools or teachers. So far it appears to be a great success, with the children using apps (47 a day, on average) and beginning to learn the English alphabet and basic words. A rather interesting experiment, don’t you think? What article (a five-letter word) can apparently be uniquely found in the north of Ethiopia but can also disputably be seen in Westminster Abbey and the British Museum in London, but happily no longer in St John’s Church in Edinburgh? Our Haile, manager of the Link Ethiopia Bishoftu office, was very pleased to be visiting the wondrous rock-hewn Church of St George in Lalibela. School Quiz: (1) Cristóvão de Gama was the son of Vasco de Gama, the famous Portuguese explorer. (2) Shake it! A Sistrum is a wooden rattle used in Ethiopian Orthodox church ceremonies. (3) Mengistu was convicted in absentia after fleeing to Zimbabwe, where he has now resided for 21 years. Conundrum: A Tabot: a small tablet replicating the Ten Commandment Tablets which were part of the Ark of the Covenant. We’d like to wish all our supporters a merry Christmas and a happy new year! See you all in 2013 for more exciting education work! Previous PostAlastair's Trip - How do we make a difference?